Well it happened once again with the rain coming in and making the main rivers unfishable and deadly again. 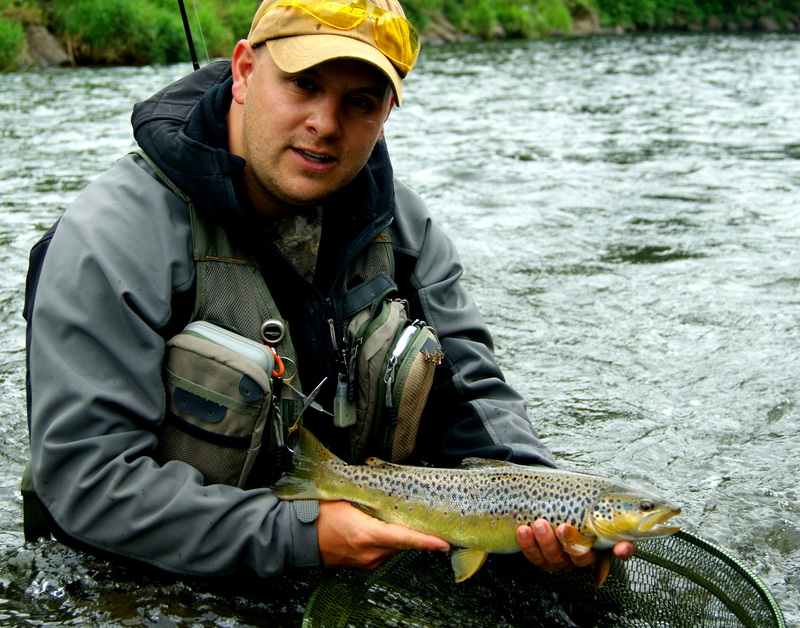 With the rivers being out I knew that the streams would be the best bet and most often or not they are totally fishable even when the rivers are way up. 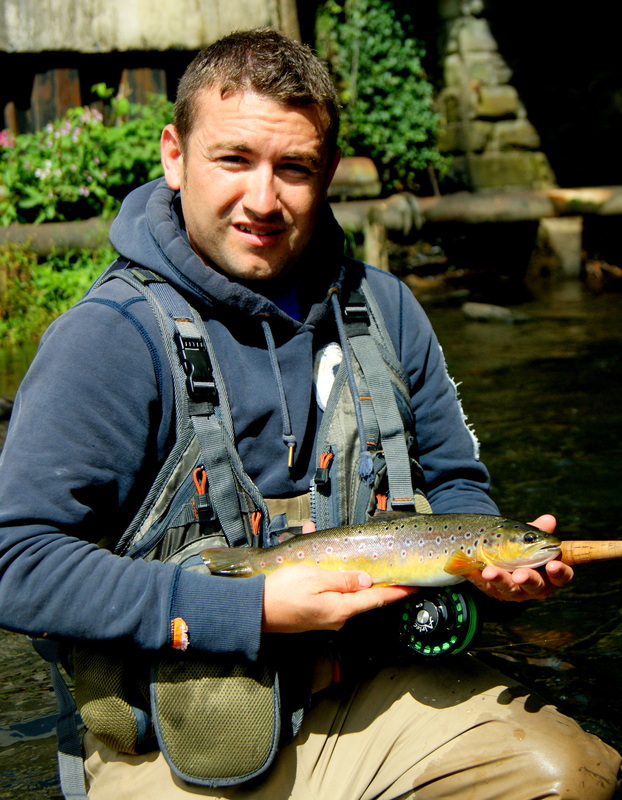 My good mate Lewy fancied a change from the bigger rivers and sewin fishing so this was a good opportunity to do so, so the stream it was. We set off around 12 taking it easy just thinking we would just have a few hours out and be home early to keep the wives happy 😉 The stream was not untouched by the heavy rains and she was pushing and coloured but it can fish quite well in these condition and from past experiences I knew that it would clear later on in the day. 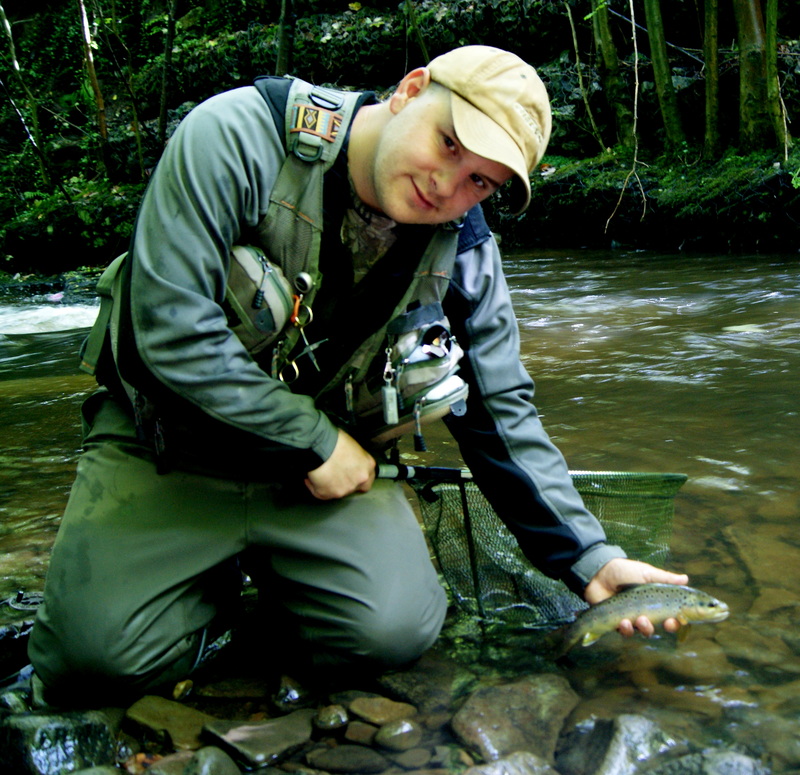 Dry fly was not an option so it was nymphing till the river cleared, I was looking out for fish on the fin but it was just pushing too much and too coloured. There was an abundance of stone flies hanging in the air and a few olives but it made no difference what was hatching in the conditions. Sion fishing a fine pool below. Sion took a few out of this pool and after the takes dried up he worked his way around the pocket water above doing the same by taking fish from every little crease and pocket There was no signs of the river clearing at this point and with a few odd showers we didn’t expect it to really. I’ll leave you with a few photos of the day below. 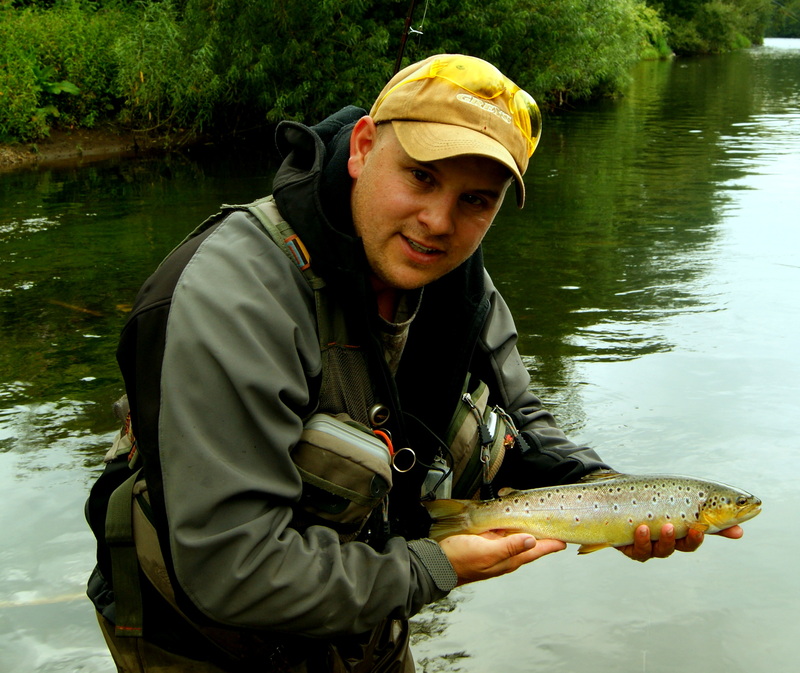 This entry was posted in Stream fly fishing and tagged dry fly fishing, fly fishing, Nymphing, rising trout, river Taff in flood, south wales, stream, stream fishing, stream fly fishing, Taff water level, Terry Bromwell, trout, water on August 26, 2012 by fishstalker666. After chatting to my mate Sion Lewis on the phone, we decided to have a few hours out before the rain kicked in as it was forecast to come in later on in the day. Sion being a good man that he is come and picked me up and off we set looking for rising fish. The timing was perfect really when we finally got on the bank with blue wing olives coming off nicely and the odd rise, but it didn’t take long for the trout to lock on and start gorging on these little wee sweeties. Makes you think on these times that all the time you have fished the river and fished these parts and not even having a take or even seeing a fish move. 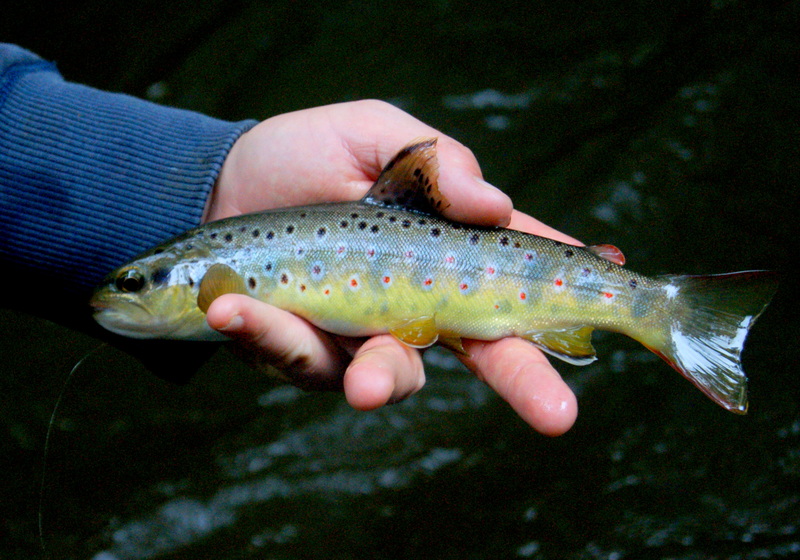 They are there but not bothered, but soon as these little jems start coming off every fish in the river goes mad. 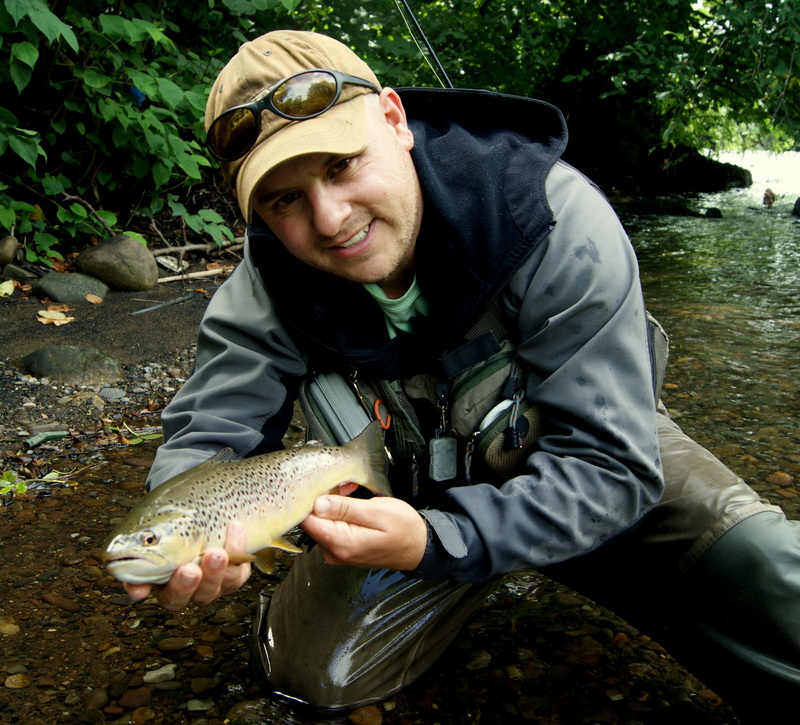 This can be a fantastic time for the dry fly angler and some great sport, you can even be cheeky and walk past fish and look for the better ones feeding. 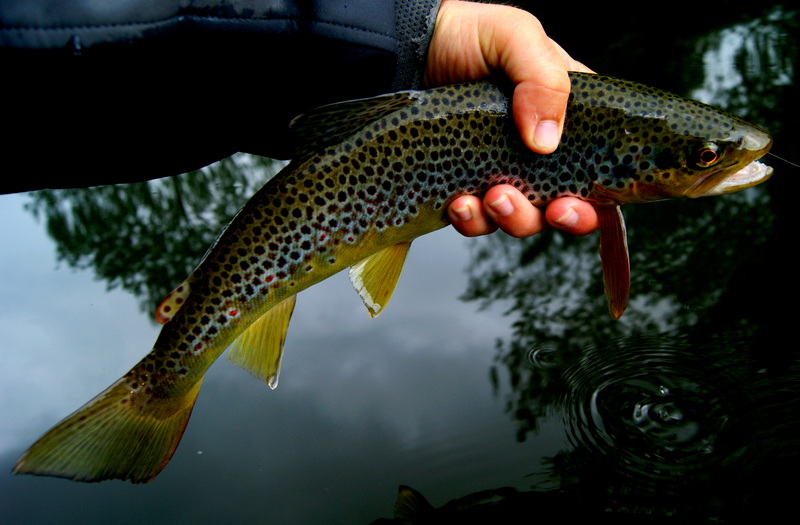 These better trout tend to be just ofF the bank and on times its like they are touching it, I had one today that was along side a large rock, I swear it must have been leaning on it and taking the flies that were touching the rock when coming around it in the flow. Love this kind of fishing because these tricky buggers can test the casting and presentation skills. Me and Sion took turns on giving the tricky fish a go and just trying to target the better fish moving all the time we were out, it was great fun! Today the bugging rods didnt have a sniff and were set aside to keep out of the way. Just a few photos below. 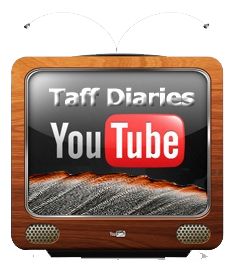 This entry was posted in Fly Tying, River Taff and tagged Blue wing olive, dry fly fishing, Dry fly patterns, fly fishing, Fly Fishing Tackle, fly hatches on the river taff, rising trout, south wales, Terry Bromwell, trout on August 24, 2012 by fishstalker666. Popping into my local fishing store, Harvey Angling. Well due to the rivers being all in flood after this awful weather we have been having, I thought i’d sort the tying gear out and check over my tackle to make sure i’ve got everything ready for when this weather buggers off and gives us Fishermen a chance to wet a line. Having a bit of time on my hand after going over everything I thought i’d go and visit my local tackle shop to stock up on leaders and tying materials for the coming grayling season 🙂 exciting times!!!. Here is a link below to the shop and they are also on facebook as Harvey angling so please check them out and add a like 🙂http://www.cliff-harvey-angling.co.uk/ It’s a great family run business and very helpful in every way. Gareth the son has recently taken over the shop from cliff retiring after a good many years. The shop has now gone under major overall and stocking a wide range of materials for all kinds of anglers. Getting back to the goodies. In the past i’ve been paying around £10 for the hends camou french leaders but with Gareth they are the cheapest i’ve seen being £5.49. what a saving yea!? This is only one of many great deals everyone are missing out on. Every penny counts these days! I know where i’ll be buying mine from now on, cheers Gar. Just a few things I picked up below. 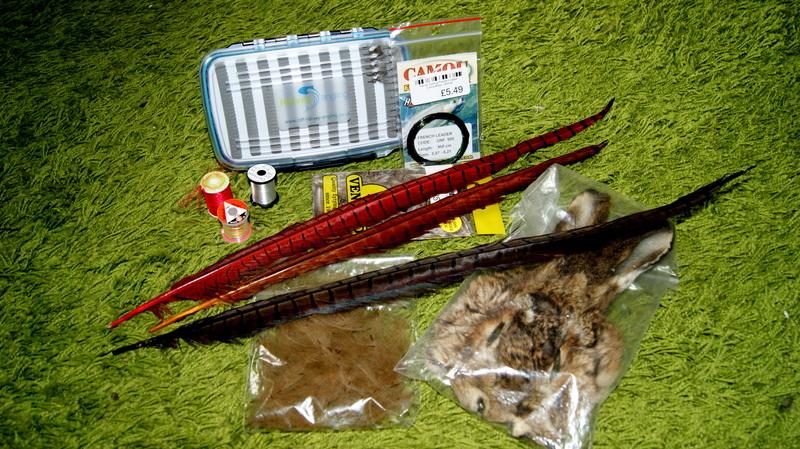 This entry was posted in Fly Tying, Harvey Angling, Taff water level and tagged fly tying, french leader, grayling, great deals on fishing gear, Harvey angling, south wales, Taff water level on August 18, 2012 by fishstalker666. Slow and steady is the way! As you know I had plans to go out today with my good friend Ceri Sweeney. 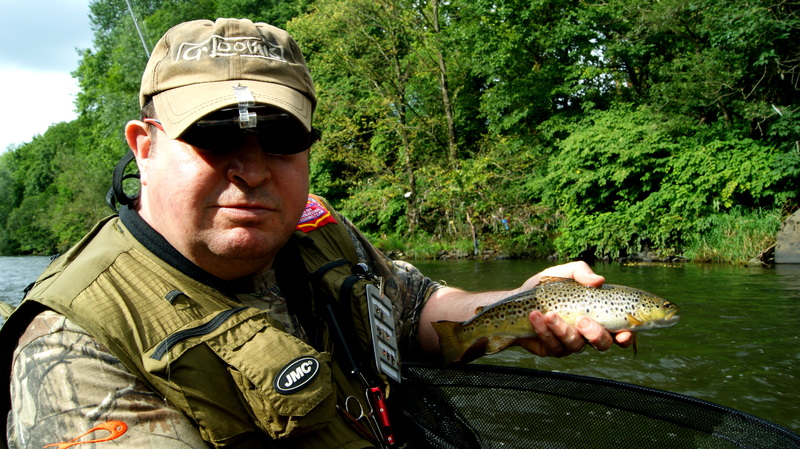 I was picked up by Ceri at 8 and off we set to see if we could have a little fun tracking down a few trout and grayling. Overnight we had rain bringing the river up a few inches and giving it a slight colour but this was a good thing because the river really needed it. After a short drive we finally got to where we wanted to try first but for the water and the time there was no point of setting up the dry so I kept that on my back and set up the french leader on my 10ft 3wt. 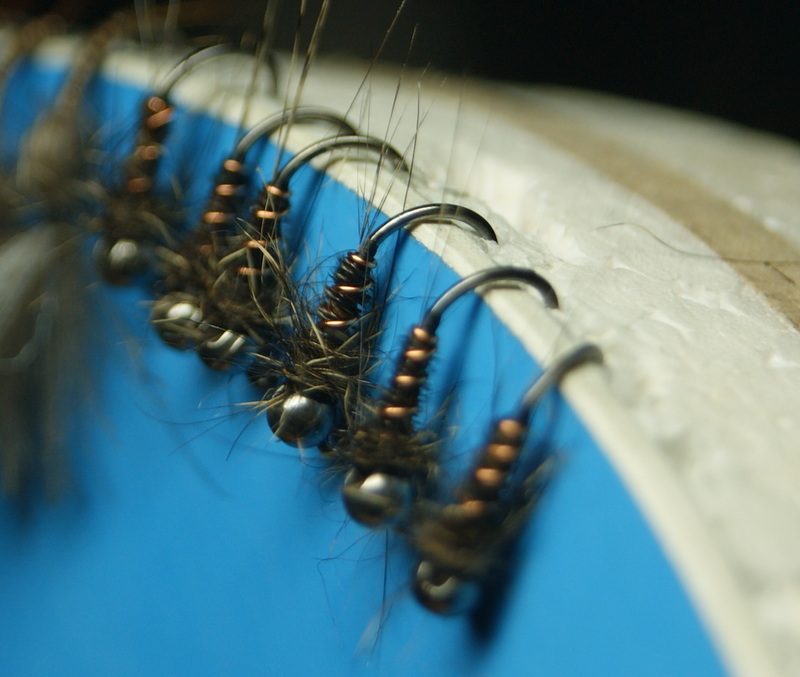 For the flow of water we were in, I had a 3m hares ear jig on the point and on the dropper a 2,5m hotspot pheasant tail. My thinking for the hotspot was that it would stand out in the murky waters. Ceri also setup on the french leader with similar weights and we pressed on fishing a long run on the far side. I decided to go below Ceri and give him some room and fish the back-end where it was a little shallower to get some idea where the fish were. After a few short casts i was into a lively trout about half a pound and as quick as i hooked it, it was released to fight again, in that Ceri just above me took a fine grayling about a 1lb and in the flow it put up a good account of itself and after a quick photo the fish was on its way to get about its business. Not a bad result in a short time. After Ceri slipping this one back there was no stopping him taking around 6 more grayling in the same area and one trout, I didn’t have much luck on the grayling front but I was doing well on the trout. As Ceri was picking the grayling off I spotted a few fish rising on the far side of the run in the slack so I pulled the dry fly rod off my back and set it up. Not sure what they were taking I put on one of my newly tied emergers . I watched for a bit before taking a cast to see if I could work out which was the best fish and after a few moments I decided to go for one just off the bank. First drift nothing but on the second drift, bang fish on. It was a trout about on the 1lb mark, didn’t get a photo holding it because it had other ideas by jumping out of the net and unhooking itself, these trout are getting wise :). As we pressed on up river I had a phone call off another mate, Mark willows, asking what I was up to and if I was fishing. After a short chat, Mark was on his way to meet us and have a dangle! Ceri wasn’t staying long because of other commitments so he planned on making a move about 1pm but before that time mark met us up and we all pressed on looking for the fish with a good amount of banter:) I wasnt even fishing and I was having bites off Mark 🙂 I think it would take more than 3lb stroft to pull that fella in mind! After covering a fair bit of the river picking off a few more fish , Ceri had to leave so I stayed and Mark left with Ceri to go up river and fish somewhere else. I planned on meeting Mark further up river later on because I wanted to check out a few spots that I havent fished for some time. 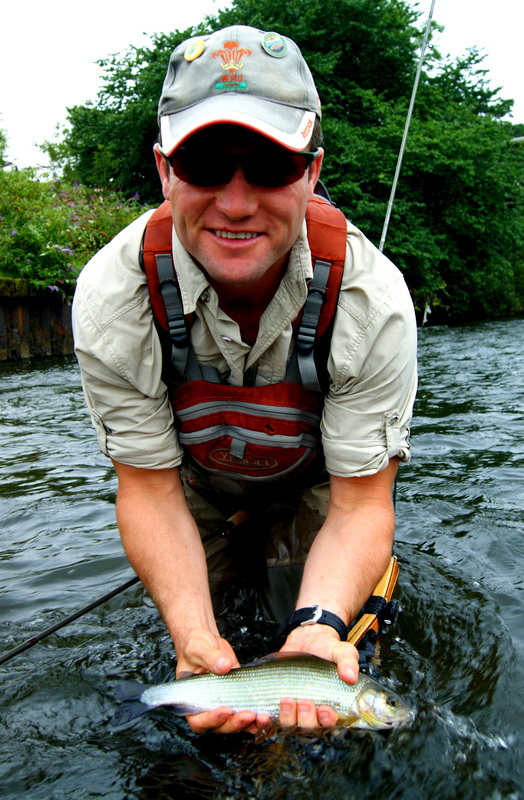 Just before the boys left, I hooked into a fine trout and Ceri took this photo for me below. 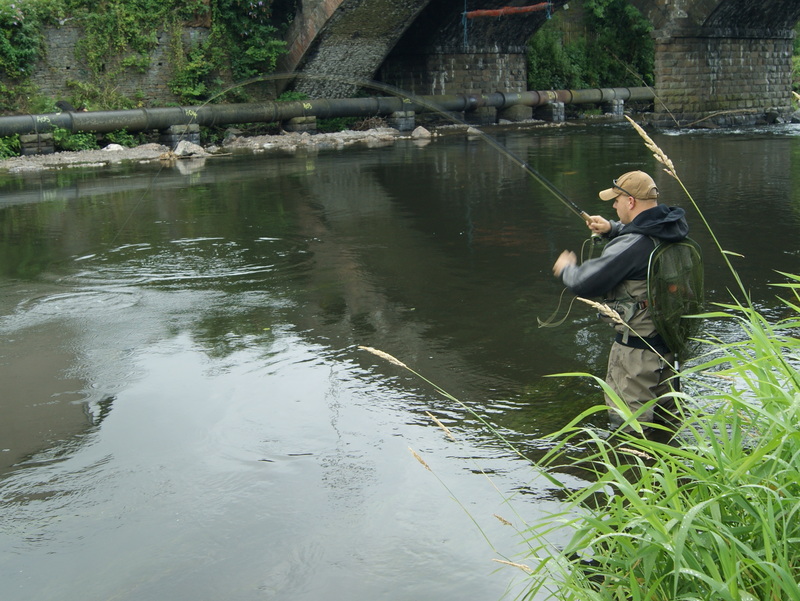 I made my way out of the fast water looking for slower waters to see if there were any fish rising, I seen the odd splashy rise but there was no way I could cover them on the far bank so I pushed on looking for something that I could cover without drowning. I finally found a few rising in the backend of a large pool so I slowly made my way up trying not spook the buggers. 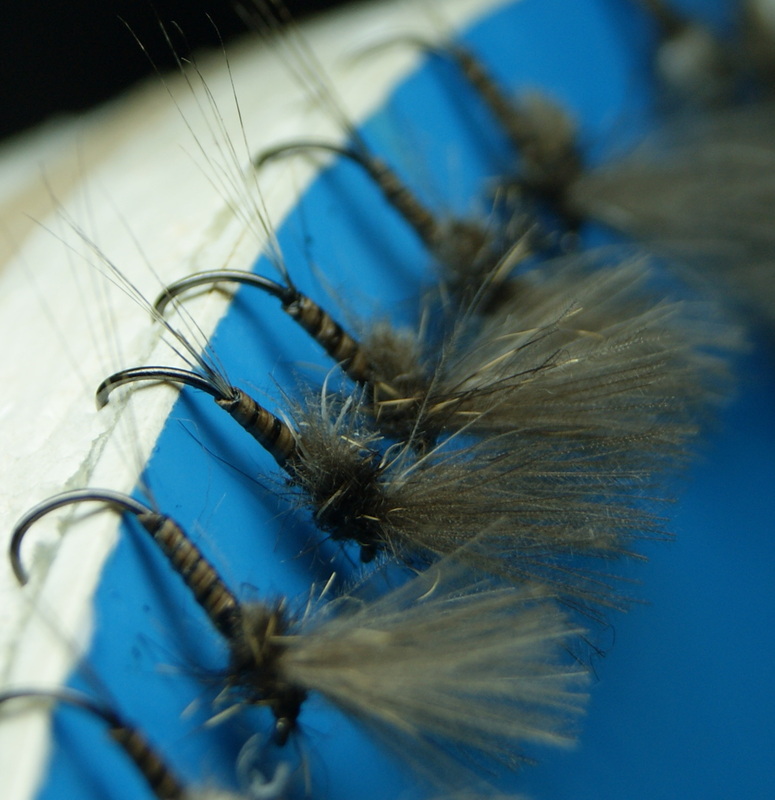 I spent some time creeping around there, taking a hand full of trout on my size 16 quill dun. One of the better ones below. I finally met up with Mark and he was with one of his mates, I was introduced and I knew his face straight away, Rob Evans, Hywel Morgans apprentice 🙂 had to get that in Rob, Mark told me to mind so get him for it hehe. 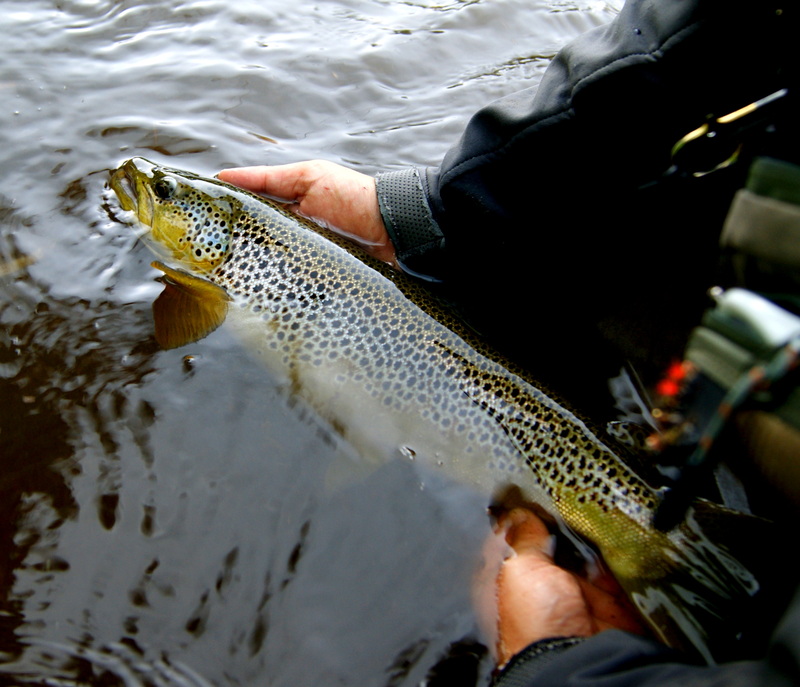 We all moved onto a long pool looking for likely spots and with that I could see a rise on the far bank so I moved over and after a few casts I was into another fine trout, i netted it after a good run around. 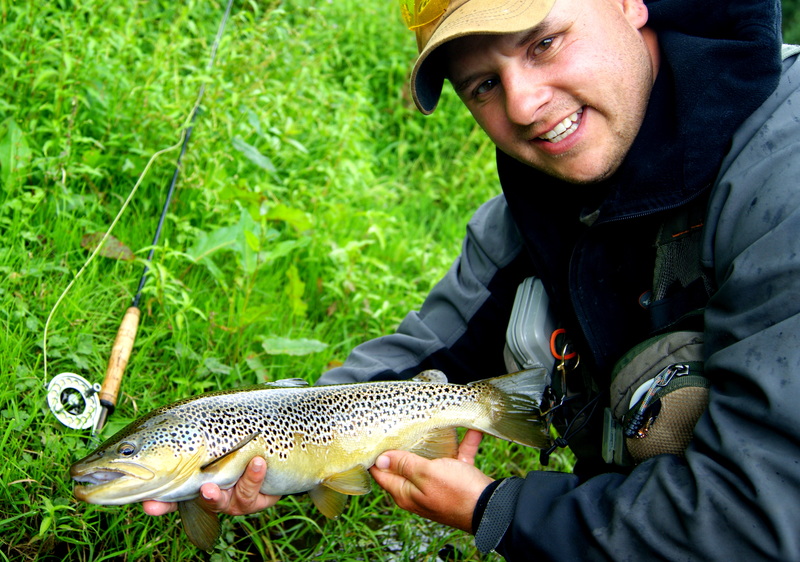 Rob said pass the cam over and took this below, another fine river taff brown trout, Cheers for taking the shot Rob! After releasing this fish I made my way out of the river with Rob to give the water a break, we talked for some time about flies, nymphs, river quality and how well the taff is doing for what it used to be like, it’s just great having this wonderful river just a stone throw away from my home in Pontypridd. As we talked on, Mark was still fishing targeting fish rising just above us in the dead slow water, not the easiest place to catch fish, fine tippets and long leaders are a must in the areas and a delicate cast. Mark is a fine angler and one of the most patient anglers I know, if there are fish there he will worry them out or if that didn’t work he would wait till the cows come home for the fish to rise again. Mark below with one that he worried out. Good angling butty. As me and Rob watched Mark working the river I spotted another fish rising not far from where the other fish fell on the dry. This rise looked much better and I even seen the fishes’s nose at one point. I made my way over slowly to get the right angle on the fish to get the best presentation and not to spook it. First cast was on the button and a few seconds after the trout come up over the dry and a split second after the strike, the trout was on and I knew it was a quite a good un at that. After a good run around and some wild runs I managed to slip the net under the fish and have a good look at this wonderful Taff Trout. 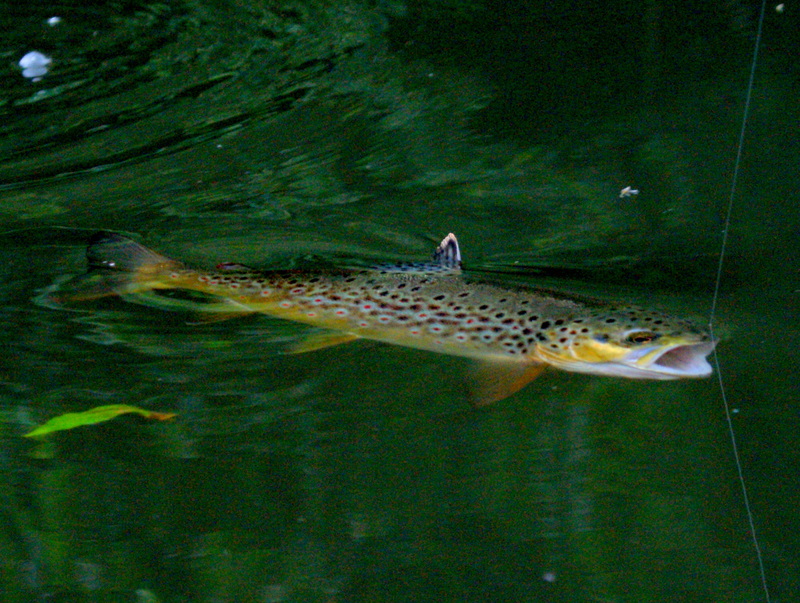 After a quick photo courtesy of Rob the trout was on its way back into the depth of the Taff. It was a great days fishing with great friends and it was very nice to meet another fine angler Rob. Rob it was a pleasure mate. I’ll leave you with a gallery of all the photos taken on the day. 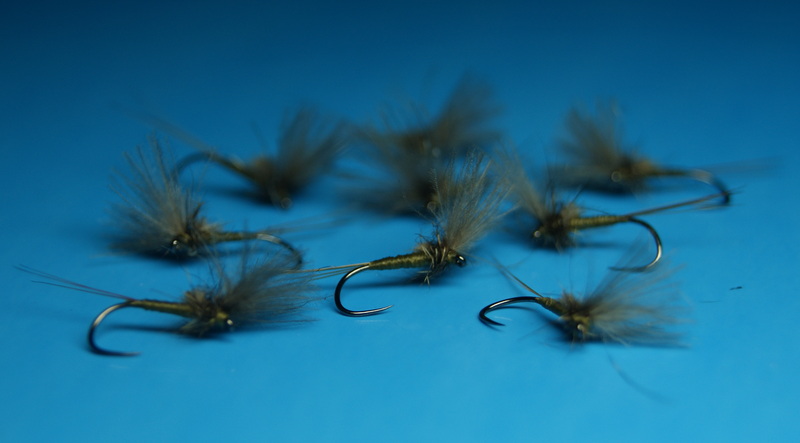 This entry was posted in Fly Tying, River Taff, Taff water level, Uncategorized and tagged Ceri sweeney, Dry fly patterns, fly fishing, french leader, grayling, Jig hooks, Mark willows, Nymphing, rising trout, river taff, Rob Evans, south wales, south wales fly fishing, Terry Bromwell, trout on August 12, 2012 by fishstalker666. Looking in the box today i found that i was running low on a few patterns so i just sat down and tied a few for an early morning trip out with my mate Ceri sweeney. 6 of each pattern tied on size 16 j hooks bought from here.http://www.flytyingboutique.com/. The water levels around my area in south Wales are quite low at the moment so smaller the better! God we need rain but not to much! Hope you like the patterns! This entry was posted in Fly tying boutique, River Rhondda, River Taff, Taff water level and tagged Ceri sweeney, dries, Dry fly patterns, fly tying, Fly tying boutique, Jig hooks, nymphs, olive duns, Olive emerges, olive jig nymphs, Rhondda, river taff, south wales, Taff water level, Terry Bromwell on August 11, 2012 by fishstalker666. I was checking the weather report last night and it didn’t look good for today but I sorted the gear out anyway just in case the weather man was lying again 🙂 As I woke up and I listened to see if I could hear the rain on the flat roof but I heard nothing so up I got and opened the window to see. 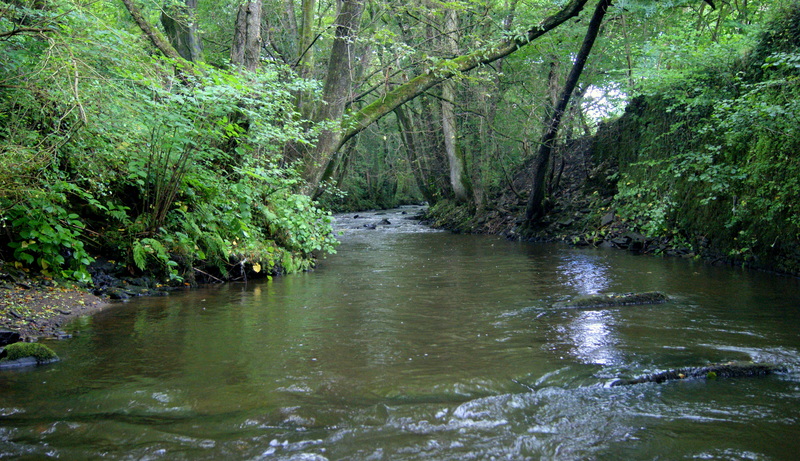 The Taff just below the house was looking totally fishable and inviting. I didn’t wait around, I just got the gear on and made my way down to the Taff, this only took me a matter of minutes and I was on the river bank checking out the far run across the river where i’ve had some fantastic sport in the past. The water was up a few inches but not noticeable really but it did have a slight tinge of colour to it. Having both rods as usual I only set the 10ft 3wt up to do a spot of light nymphing on the slack side of the run that I was looking at. The water depth was around 2 ft at most so I pulled about 3ft of stroft off and tied that to the indicator and at the point I tied on a single nymph, it was a black bead hares ear jig, size 16. I slowly got myself into position just below the run so I could cast the french leader up into the run and keep the indicator pointing up river giving me direct contact with the nymph. Light nymphing can be so delicate and the takes just the same. Sometime the takes can be that delicate that you wont even see the line move or stop. It’s like a sense that something is wrong so you strike and there the fish is. Casting my way up the slack side I managed to fool a few trout and as I hit the head of the run I changed the weight of the fly so I could cover the more turbulent water. Many more fish fell to the single fly in this kind of water and after the takes slowed down I came from there looking for the next likely looking spot. At this time my good mate Sion Lewis turned up looking to fill his boots with the wild Taff brownies.. The sun was bright for a while but it didn’t take long to cloud over and then the rain started and the river become quite coloured. Fishing become quite tough but we both pressed on fishing close to the banks and margins and the very slow waters of the fast runs. Visibility was very poor but we still manged to take a few in these conditions . 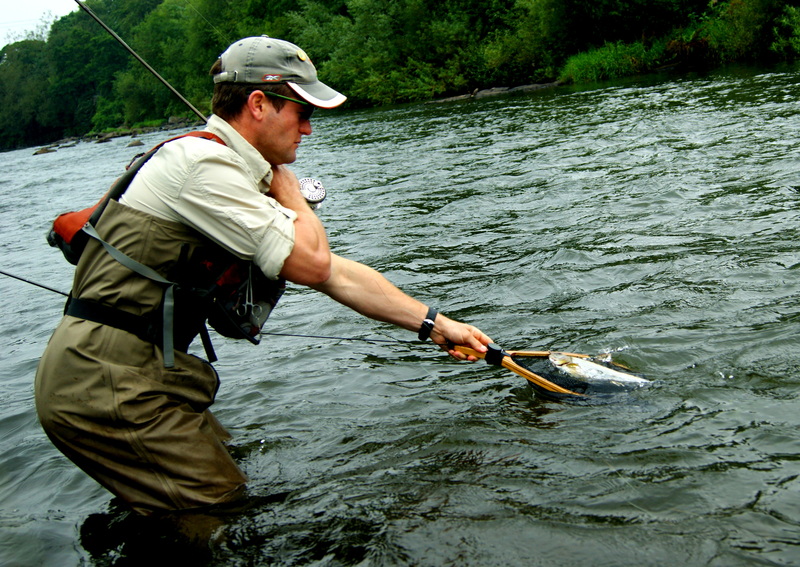 Sion moved on up river past me targeting the much shallower water where visibility was much better. I kind of watched Sion fishing for a while and he was doing really well by taking fish from every small run and from behind every rock that was visible. Sometimes I just like to watch other anglers fishing and see how they tackle certain waters and how they go about it. After another hour the condition just got worse and the river started to rise even more so that was that really. Not a bad few hours and some cracking sport with a good mate! 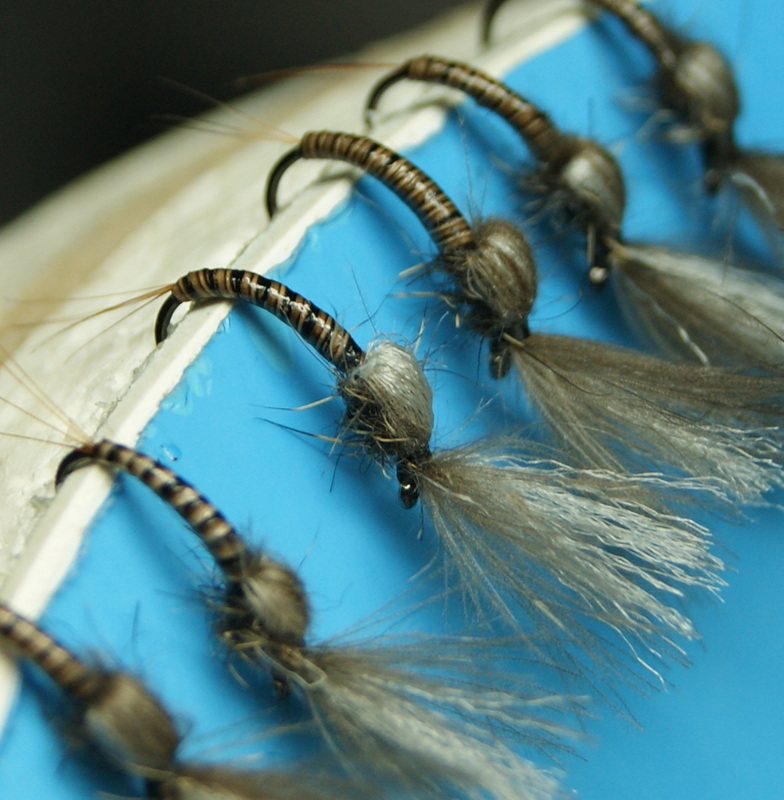 This entry was posted in River Taff and tagged dries, Dry fly patterns, french leader, hares ear jig, rising trout, river taff, sion lewis, Taff, Taff water level, Terry Bromwell, welsh trials on August 4, 2012 by fishstalker666.